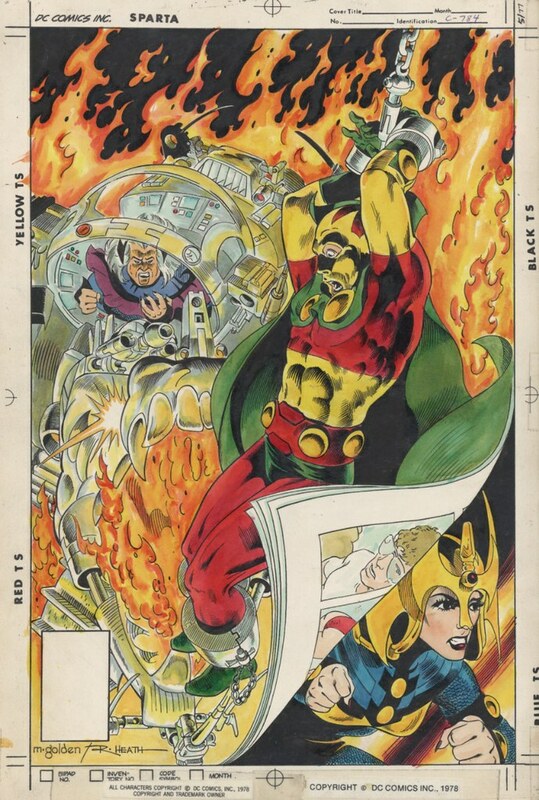 After Marshall Rogers left the Mister Miracle series in 1978, comic fans struck gold when the artistic team of Michael Golden and Russ Heath came onboard the title. Not only that, Steve Gerber replaced Steve Englehart as the writer. This cover by Golden & Heath was for meant Mister Miracle v1 #26 in 1978. It was never used due to the series being cancelled with issue #25. Albert Moy owns this cover and made this comment that the piece was "colored by someone no one knows. Oh well, wish I can get the colors out." I love the motif of the comic book page being turned to reveal Big Barda. Perhaps they were going to have a solo Barda story as a backup tale? Nuff Said! Link: Albert Moy Gallery at ComicArtFans.